May 28, 2015 – A new view of Ceres, taken by NASA’s Dawn spacecraft on May 23, shows finer detail is becoming visible on the dwarf planet. The view shows numerous secondary craters, formed by the re-impact of debris strewn from larger impact sites. Smaller surface details like this are becoming visible with increasing clarity as Dawn spirals lower in its campaign to map Ceres. The spacecraft snapped the image at a distance of 3,200 miles (5,100 kilometers) with a resolution of 1,600 feet (480 meters) per pixel. The image is part of a sequence taken for navigational purposes. The region shown here is located between 13 degrees and 51 degrees north latitude and 182 degrees and 228 degrees east longitude. 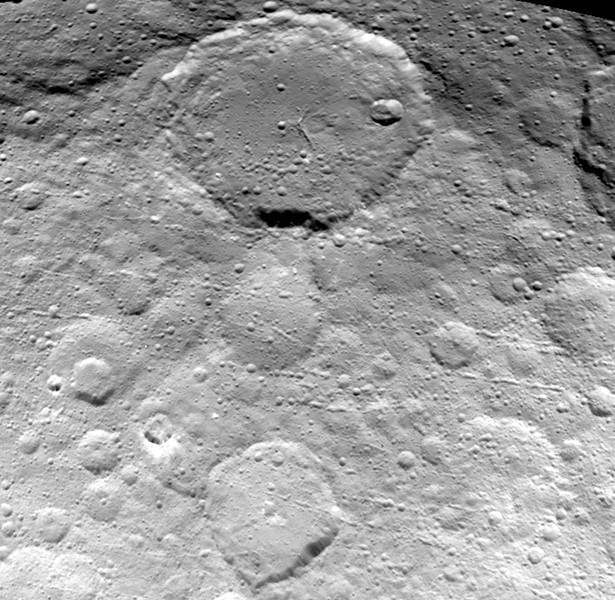 The image has been projected onto a globe of Ceres, which accounts for the small notch of black at upper right. OpNav9 is the ninth and final set of Dawn images of Ceres taken primarily for navigation purposes. 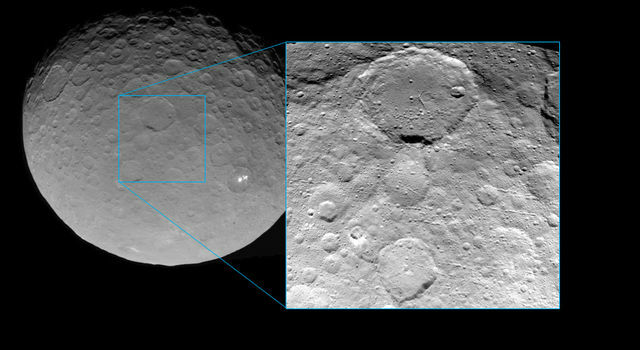 Dawn is the first mission to visit a dwarf planet, and the first to orbit two distinct solar system targets. It studied the protoplanet Vesta for 14 months in 2011 and 2012, and arrived at Ceres on March 6, 2015.